Mikhail Illarionovich Kutuzov: An Obsession. Originally posted to commemorate the 200th anniversary of Russian military history’s much maligned and misunderstood icon (September 16th 1745 – April 28th 1813) and his most famous campaign against Napoleon, but reposted with updates on the eve of the BBC’s grandiose new production of Tolstoy’s War and Peace in 2016, and the news that Barbara Streisand is to direct a film about the early life of Catherine The Great – who Kutuzov served under and had a personable relationship with (she would always refer to Kutuzov as one of her favourites). 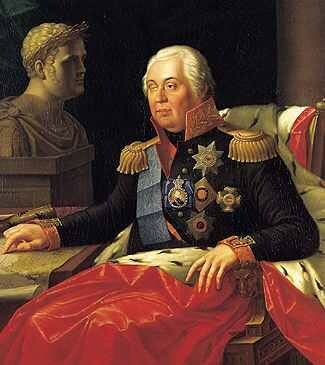 The twice, near fatally, wounded Marshal Kutuzov will forever be synonymous for commanding the Russian forces against Napoleon during 1812, and for the disastrous battle of Austerlitz (perhaps one of Napoleon’s greatest achievements and victories). Portrayed as the ultimate Russian saviour by both Tolstoy and Stalin when it patriotically suited, his memory has ever since been besmirched and belittled by countless scholars, historians and writers. Whilst the truth lies somewhere in-between, for such a strident and divisive figure, Kutuzov remains (outside his homeland) a vague if not hidden figure from the annuals of military history. 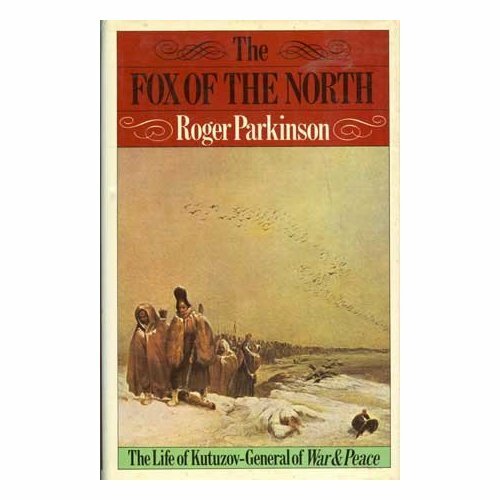 In fact the only actual English language bio available (as far as I’m aware) is the perfectly woven 240-page turner, The Fox Of The North, by the late great military authority Roger Parkinson from 1976. Of course his name and sly wily intuitive nature is celebrated to a degree in that great tome War and Peace, yet most of what we know in the western world about the inimitable general is hardly commendable. His interaction with Catherine the Great, ‘Mad’ Paul, Alexander I or the hard fought campaigns against the Ottoman Empire and his epic struggle with Napoleon have so far been muted as mere footnotes. I’m totally fascinated and obsessed with Kutuzov’s story. A passion borne from my fathers own penchant for everything Napoleonic (from wargaming to studying). His copy of Parkinson’s book was handed down to me; a trigger for a decade long fixation, which led me to write a film script based on the life and times of the (in my eyes) much discredited and ignored general. Originally marking the 200th anniversary of his death in 1813, but subsequently tying in with the BBC’s latest on-screen adaptation of War and Peace and the general interest in Russian history (mostly out of anxiety, as Putin takes aggressive control of the Syrian crisis and ISIL), the Monolith Cocktail brings you three of our favourite tomes on the subject of both Kutuzov and the 1812 invasion of Russia. Entirely the preserve of the ebay consumer now, this erudite and accomplished guide went out of print decades ago. From the pen of the late Roger Parkinson, whose other subjects have included the Prussian military genius Clauswitz (who served on Kutuzov’s staff during the 1812 campaign) and firebrand leader, Blucher, as well as Zaapta and various trysts on the Second World War. Obviously a great admirer of the amiable leader, Parkinson went behind the iron curtain to find the source material: from personal affects to diary entries. Allowed reasonable manoeuvre around the various sites, museums and archives, the author pieced together the fullest picture yet of Kutuzov. In answer to critics, the books travail through 60-odd years of Russian and European history both puts right the myriad of charges levelled at the marshal, and also puts to rest all the idle gossip. More at ease, despite the high society background, with the soldiers on the ground than with the staff, or even for the most part with the succession of Tsars (and one Tsarina, Catherine The Great, with whom he had an affectionate if not flirty relationship). His knack for the, cliched I know but entirely apt, ‘common touch’ and shrewd, deliberated manner made him many enemies, especially amongst the aristocracy. Cautious, to a fault so his dissenters would have us believe, Kutuzov’s tenure under the wing of that other 18th century celebrated Russian hero, Suvorov, and subsequent study of warfare beyond the borders of Russia taught him that it was more important to tactically withdraw, harass and frustrate the enemy than to face a calamitous ‘winner takes the field’ grand battle – the sort very much favoured by most figures during the Napoleonic period, right up until even the First World War. More important to win the eventual final victory than worry about obtaining glory in individual pitched warfare. For this theory and execution, Kutuzov was often branded lazy, and even cowardly; his command of Russian forces during the disaster of 1805, which led to one of these very final battles he dreaded and tried to avoid, Austerlitz, didn’t exactly elevate that reputation: a resigned Kutuzov brow-beaten, under tremendous pressures from his naive and petulant Tsar Alexander I, and at the centre of a coalition of inapt advisors, generals and supposed tacticians, with a language barrier that hardly made matters better, was more or less dragged into the battle. It also doesn’t help that the only descriptions of Kutuzov are formed when he was approaching his late 60s, overweight, battle scarred and full of arthritis. With its miscreant, celebrated, honoured and amusing cast of characters, The Fox Of The North is a free-flowing account, devoid of the bogged-down school of statistics and overbearing jargon, which enlightens the reader to the history of the burgeoning behemoth of Russia: with Napoleon’s demise, Russia was left largely unchecked until the Crimean War; able to flex and grow into a super power. And now, rather poignantly, Kutuzov’s various battles and eventual truce with the Ottoman Empire in 1812 proves enlightening reading, as it chimes with Russia’s current diplomatic sword fight with Turkey, and the Syrian crisis. 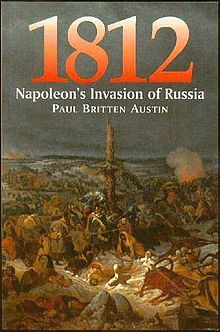 Momentous as everything 1812 should be, the three-in-one edition of eye witness accounts from the French and allied armies, during the invasion of Russia, is a staggering compendium unequalled. Larger in scale than even War and Peace, the three previous individual editions – The March On Moscow, Napoleon In Moscow and The Great Retreat – were collected into one behemoth tome not so long ago. Perhaps, actually sod it, this is the most accomplished purview and account yet. From the humble, put-upon, foot soldier to the highest echelons of the ‘grande’ army, hundreds of letters and thoughts piece together what would become a living hell. So evocative and descriptive, the campaign is brought to vivid life and opens up the deplorable day-to-day labours of survival in a harsh environment, when one minute you’re singing and dancing on the road to yet another victory, the next fighting for the last morsel from a frozen solid, dysentery inducing, cannibalised horse. Or perhaps so resigned to fate and survival that you nonchalantly warm your frostbitten limbs against a burning building of screaming comrades instead of rescuing them – though as one account so gruesomely retells of such woeful desperations, a group of French soldiers who found one of the only buildings for miles still untouched by destruction, barricaded themselves in to keep warm (and to keep the hoards out) unfortunately set fire to their sanctuary and in the ensuing panic to escape, burnt to death as those outside looked on and warmed themselves up in the ill opportune moment. With a united colours of Napoleon force (conscripted and brow-beaten from over 14 nationalities) of 600,000 men and 150,000 horses, the outcome looked bleak for Russia. However, harassed, bludgeoned to a score draw at Bordino (one of the bloodiest battles ever fought on European soil) and constantly pressed by a increasing method of partisan/guerrilla warfare from the Russians, Napoleon made steps to sue for some sort of peace. Alexander I declined, and instead pushed Kutuzov to finish off the enemy, which though bloodied still commanded a sizeable and fierce resistance. Moscow would be Napoleon’s tomb, as Kutuzov envisaged. The only cause of action was retreat, and this is where the books horrific details really come into their own, as ‘general winter’ set in. Now not only pursued and aggravated by the Kutuzov led army (which evidently was itself suffering from illness and the -20 degree temperatures), the unforgiving Russian terrain in the most hostile weather conditions sent more Frenchman and Europeans to their deaths than the battles did. We learn, in a macabre but scholarly way of course, the depths humans will go to survive, as it’s every man for themselves. Lack of…well everything, the countryside stripped bare on the way in now empty for the troops on their long retreat home. In adversity we hear various jolly anecdotes of course, but for many this was as near to the pits of hell, but without the heat, you could get, as men fell asleep only to wake to find themselves frozen together, or being half eaten by comrades and scavenging carrion. We also learn that the Mediterranean, especially Naples, troops, rather than fall apart at the first sign of snow, were actually jovial enough to survive – their Northern comrades suffering far higher casualties from the cold. Another eye-opener – as it were – is the high level of literacy even among the ‘common’ privates. Of course these notes and letters home have been edited and proofread to a degree, but every strata of the Napoleon army seemed to at least have the basic rudiments of writing. It’s a shame we haven’t had the equivalent from the Russian perspective, but this is maybe due to lack of personal accounts. Winner of the prestigious Wolfson Prize For History, Dominic Lieven‘s account sets out to strip the myth from fact. 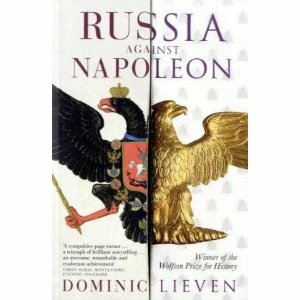 Highlighting the deeds of the often overshadowed, be they civil service, generals, back room staff or politicians, Lieven credits the Russian victory of 1812 and final destruction not to the usual cable of celebrated heroes but to the often overlooked foreigners, employed in the service of the Tsar. In fact he argues that patriotism has often taken over; Russia promoting its own homegrown figures over those from outside its borders like Barclay de Tolly and Wittgenstein. Though one of the most well written and engaging reads on the subject of the 1812 campaign, and subsequent allied invasion of France in 1813 (Kutuzov died during this campaign from fever, whilst travelling between posts in East Prussia), there does seem to be the usual dismissive prejudice towards the cunning ‘fox of the north’ Kutuzov, whilst the often flustered and inpatient Alexander I is shown in more glowing terms. He goes on to aim quip jabs, such as his, ‘energy was suspect’; not surprising seeing as he was 67 at the time, had arthritis, and let’s not forget, had suffered decades before two serious head wounds, both near fatal which continued to bring him much discomfort. Despite this, the books exhaustive study looks at every facet, from failed diplomacy to the readying of war, bringing to light the stories so often missing from military history.